• Great Pyrenees dog breeders are listed below alphabetically by State / city. 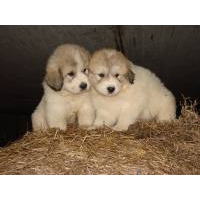 • Click on underlined words to see Great Pyrenees puppies for sale. • Please tell the Great Pyrenees breeders with puppies for sale that you found them on BreedersClub.net. The Great Pyrenees dog breed is an excellent guardian of flocks. One of the Gentle Giants, this breed is large, affectionate to its owners and prefers hard work. The coat is thick and weather resistant allowing it to work in various climates. Great Pyrenees need to be exercised daily on a leash or in a fenced area. Champion sires and Champion bloodlines. Bred for size, temperament, conformation and soundness. Fully Health tested parentage..30 plus years showing and breeding. Raised with lots of love and attention. We also have the occasional rescue dog available. We are an AKC Breeder of Merit. Our dogs are our family companions, and our LGD's are our working farm dogs... we allow them to have litters periodically. Our pups are not kennel-raised, but are either raised as companions in the fenced acre surrounding our house, or are raised as livestock guardians in the barn and surrounding acres with our sheep. Our dogs are on a primarily raw diet to optimize health, and pups come with a 2 1/2 year health guarantee. Pups are vet checked and up-to-date on vet work before going to their new home. Melport Meadows is a licensed breeder in the state of Wisconsin. This breed directory page features Great Pyrenees dog breeders with puppies and/or adult dogs for sale. Once you purchase your new found friend, you will want to provide it the best in pet health care. Be sure to visit our online discount pet supplies catalog and order NuVet Plus™ to keep your puppy and adult dogs in top condition. The discount catalog also features collars, leashes, carriers, general pet care products and much more. BreedersClub.net does not pre-screen the Great Pyrenees dog breeders who advertise their puppies and dogs for sale in the BreedersClub.net breeder directory and in the classified ads. We require all advertisers to agree to our advertising terms. 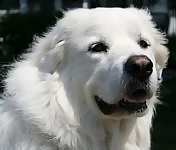 You should ask the Great Pyrenees dog breeders you talk with for references from past buyers and veterinarians.